I have seen more than my fair share of head gasket diagnosis from repairing Subarus. I’ve done so many, I can pretty much do it in my sleep and without pulling the motor from car. Diagnosing a head gasket issue is easy, but some may not understand how or why it happened. 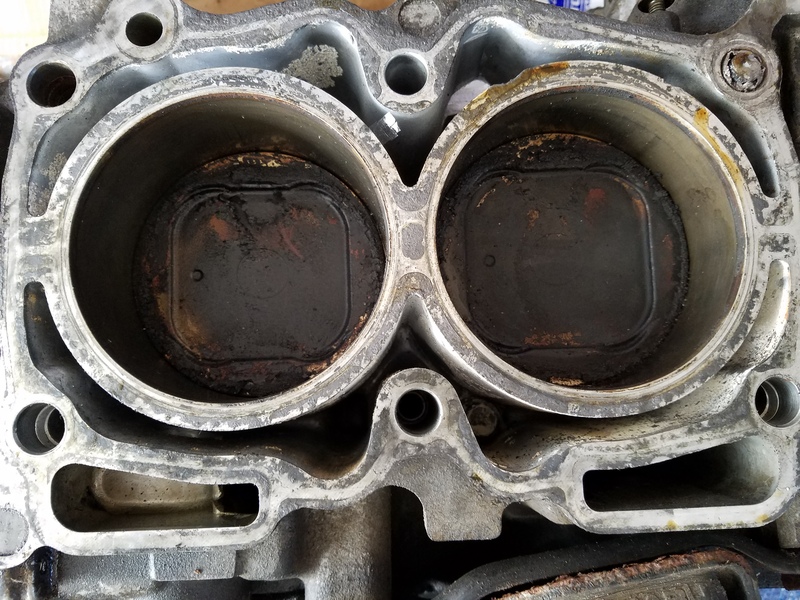 Many Subie Newbies do not understand the unique nature of the boxer engine, so its natural for them to retort with a comment like “But the car has never been overheated” or “I shut it off as soon as I saw the gauge go above half, are you sure it’s a head gasket?”. In traditional inline or V-shaped engines, a head gasket usually fails when an engine is excessively overheated. 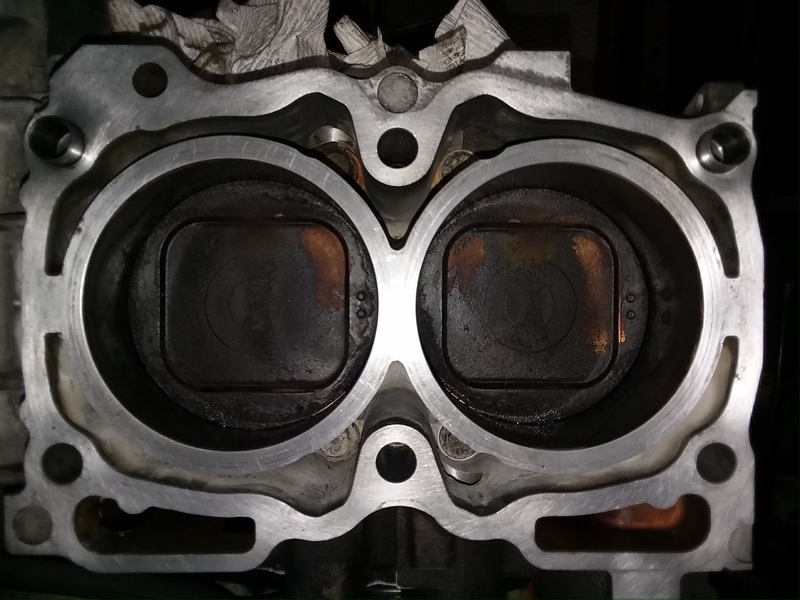 The block and head expand at different rates when the cooling temperature breaches it’s critical cooling point and causes the head gasket to become damaged due to compression inside the motor between cylinders. This is typically how most head gaskets fail. The Subaru engine is not your typical engine, though. It is a horizontally opposed engine. As much as the naysayers like to deny that the primary reason for the failure is a design defect, it is 100% attributed to many design flaws. It is no secret that the 2.5 engine is notorious for blowing head gaskets. But why? Let’s take a look at two Subaru blocks. The block on the right is a Subaru EJ22E, found in early Subarus from 1990-1998. 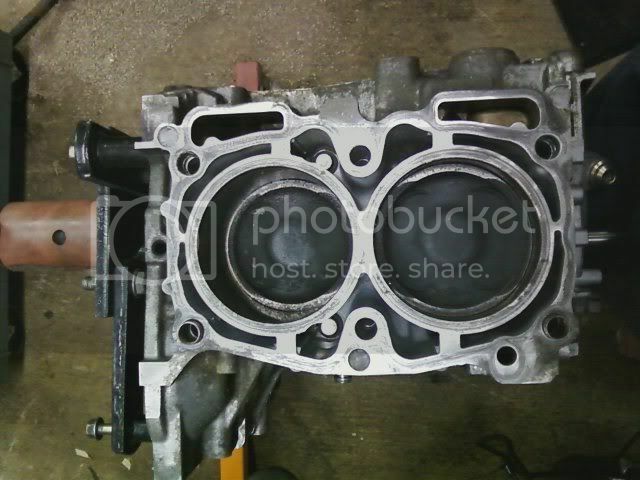 The block on the left is a Subaru EJ25D found in Subaru Outbacks from 1996-1999 and the 1998 Forester and Impreza 2.5. It may be hard to tell without a caliper, but the bore size is smaller on the EJ22 (96.9mm) than it is on the EJ25 (99.5mm). To create the 2.5L, Subaru took an EJ22 block and bored it 2.6mm over, decreasing the cylinder wall size. This is first contributing factor, but the second factor explains why not all 2.5L Subaru engines are not created equal. In the Subaru engine world, you’ll frequently see terms like “open deck”, “semi-closed deck”, and “closed deck” or “sleeved”. These terms refer to the type of reinforcement that keeps the cylinders round under heavy load. Have you even seen a glass flex when subjected to high frequency sound? Essentially, the same thing happens inside the cylinder sleeve of an open deck engine under high RPM. This motion isn’t enough to cause damage to the cylinder sleeve, but the motion is enough to wear millimeters off of the head gasket mating surface over time. The updated gasket style helps by building a metal ring around the combustion chamber to not only seal the combustion chamber from any leaks, but to provide some rigidity to the cylinders. The smaller engines aren’t susceptible to this flex is due to the increased thickness of the sleeve that causes it not to flex. This is also the reason that the turbocharged 2.5L engine from the WRX, STI, Legacy GT, Forester XT, and Outback XT do not have the failure. Their blocks are semi-closed, as shown below, to provide rigidity under high pressure conditions found with boosted cars. Up until 1996, Subaru used a composite gasket material, similar to an exhaust manifold gasket, for its head gaskets. There were a small percentage of the older 2.2 engines that suffered failure with these gaskets. For the 2.5, it started to wear out around the metal ring for the cylinder sleeve and would seep coolant into the combustion chamber until the coolant level dropped low enough to no longer cool the engine. It also allowed excessive pressure to build up in the cooling system that it would blow coolant back into the coolant overflow bottle. Some times, the coolant would enter the oil system and cause more severe damage to the rotating assembly. In 1996, Subaru switched to a multi-layer steel (MLS) gasket that was coated in a graphite type material. The theory was to create a gasket that was less prone to damage due to normal warpage of the cylinder wall. Over time, the film would wear out to the point where it would create a void that allowed coolant to seep into the combustion chamber or into the oil system. Subaru, and many aftermarket providers like Mahle, Cometic, Six Star, and Felpro, have stepped up to create a revised gasket that is stronger. 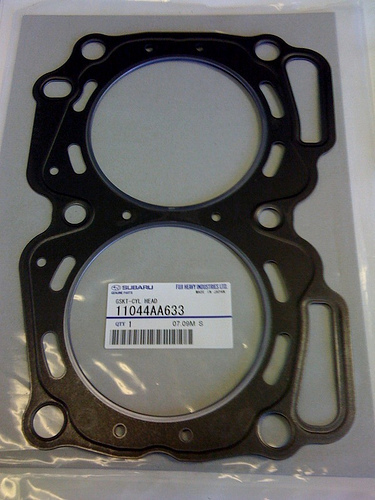 This new gasket from Subaru came along around 2005, shown below. By 1999, Subaru starting seeing the new MLS gaskets fail at a similar rate to the old composite style gaskets. Research suggests that the charging system on Subarus was causing an unusually high pH level in the coolant causing it to become corrosive. A car’s cooling system acts as a ground and as such is highly conductive of electricity. When the engine is not properly grounded, or the charging system experiences higher than normal resistance (load), the amount of resistance in the cooling system increases and causes electrolysis. This changes the chemical structure of the coolant causing it to be higher on the pH scale and to start exhibiting corrosive properties. As a result of this, Subaru announced in 2000 that they would begin to add a coolant conditioner to help lower the pH levels in the coolant. Further, in 2003, they started to add more ground straps to the engine to reduce the amount of resistance that flows through the cooling system. So when did they finally fix it? This is a common question that I get for people who are considering buying a Subaru with a 2.5 engine. It is hard to say exactly the year that Subaru fixed the issue because there were so many fixes in a short amount of time. Post-2005 is generally the year I like to give people because of the advances in the head gasket design, addition of more frequent cooling system maintenance to the owners manual, and addition of many more ground straps and coolant conditioner to all the vehicles. When I do a head gasket repair, I always ensure I am using a high quality gasket, use Subaru OE coolant, add the required amount of coolant conditioner, and add more ground straps to the charging system. 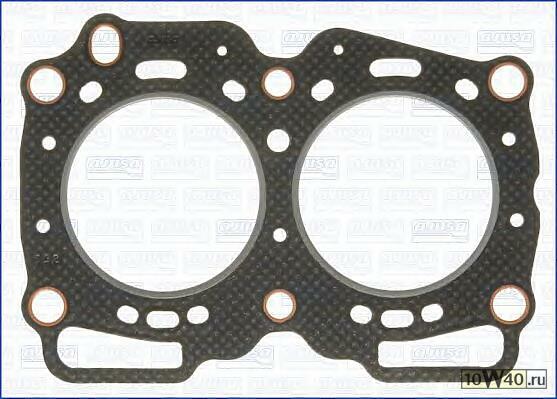 In my video about Subaru Head Gaskets, I mention about getting quality head gaskets for cheap. I frequently shop on Rockauto and buy up all the Mahle and Fel-Pro gaskets when they’re on manufacturer closeout. Typically I can buy a complete pair for less than $40. The part numbers below are the ones for the newest design of gasket. Yes, there is an inner sleeve that attaches to the torque converter that you need to remove from the transmission to reattach to the torque converter. This helps prevent the transmission pump binding up and cracking the housing when you’re putting the engine back in the car.